Have you ever wondered why your ribs come out either dry or under cooked each time you make them. You use the same charcoal or gas and yet you get different unsatisfying results each time. Well, this is the best BBQ ribs recipe for Ribs out there. It's easy to follow and gives you specific ingredients that you need to make this a successful process every time in some very easy steps. No more tough, dry, under cooked ribs. Just meaty juicy results that come out with the same texture and quality every time. Here's what you'll need and the steps you'll need to follow. 2. 1 Rack of Ribs, beef or pork whichever suits you. 11. Add the Honey, Teriyaki or Soy Sauce, Thyme and 4 Tablespoons of Jake's Famous BBQ Sauce. 14. Grill or your broil to create a glaze on the ribs. Use medium high heat then place the ribs on the grill for 10 minutes until grill marks show up. For broilers use a 5 minute setting. 15. 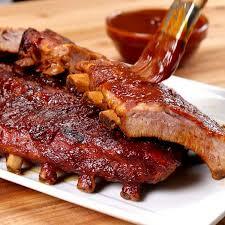 After your perfect slow cooked BBQ ribs have completed cooking let rest for 3 minutes. 3 Lbs of Baby Back Ribs "uncooked"
Following the cooking and grilling process it is more important that ever to rest the cooked meat properly. Meat whether pork, beef, or chicken is mostly made up of water somewhere around 50 to 75%. Combined with that water is protein and fats. Deep within the recesses of the meat at the structural level is an area called Myofibril structures which are basically pockets that make up the muscle fiber of the actual animal. When meats are grilled, baked or barbecued heat contracts the proteins which forces water out through the myofibrils ultimately causing the meat to shrink in size. When meat is allowed to relax after cooking the pockets will relax somewhat which creates and almost capillary action to reabsorb the released moisture. The end result is what we are all familiar with known as juiciness. After you've allowed meats to relax a few times after cooking you'll begin to develop an almost third sense about how long a particular piece of meat should relax before losing too much heat. So, all in all relax your meat to achieve perfect juiciness. To help out we've added our temperature chart to ensure that your slow cooked ribs reach the perfect degree of doneness.